Pricing Table Addon for Visual Composer for adding pricing tables to your WordPress website created using WPBakery Page Builder. The best WPBakery addon to display pricing tables in your WordPress website. 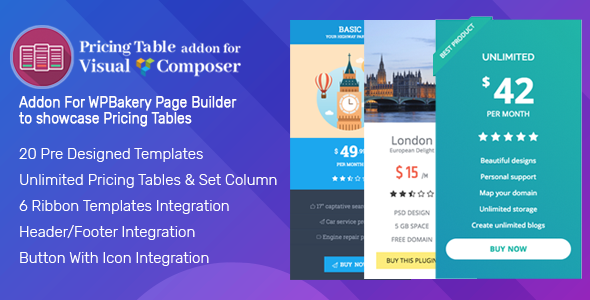 Pricing Table Addon for Visual Composer is a Premium Pricing Table Addon plugin for WPBakery Page Builder(formerly Visual Composer). It only takes a few minutes to set up, and even lesser to integrate into your site. WPBakery Page Builder supports addons that can be added as elements into your website. Adding Pricing Table Addon as an element in WPBakery Page Builder helps you integrate Pricing Table Addons anywhere and manage changes visually. Set Pricing Plans with selling price, marked price and payment type (price unit). Pricing Table Addon Addon for Visual Composer works best with WPBakery Page Builder plugin and standarized themes from ThemeForest. It’s even more remarkable when used with popular themes like VMagazine and AccessPress Parallax.